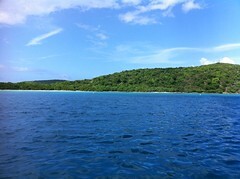 The pic above is another one of Culebrita. We took it last Sunday when we ran over to Culebra. We have to get back there soon so we can explore all the beautiful beaches. We have friends going over on their sailboat for the 4th of July holiday and staying a few days. Hopefully we'll get to run over as well. Fingers crossed. Well, hope everyone has a great weekend!